A highly significant event for the nation, the 140th Assembly of the Inter-Parliamentary Union (IPU), will kickoff in Doha today with more than 2,200 delegates and 80 heads of different world parliaments. All preparations haven been made to ensure the event is a massive success. His Highness the Amir Sheikh Tamim bin Hamad Al Thani will grace the opening ceremony with his presence and deliver a speech to mark the occasion, reported Gulf Times. The opening ceremony will also see the participation of the IPU president Gabriela Cuevas Barron, the United Nations Counter-Terrorism Office the under-secretary Vladimir Voronkov, speakers of parliaments, national councils, legislative councils, senates, and heads of delegations participating in the assembly, in addition to members of the union's executive committee, organizations, and regional and international unions. Additionally, the IPU statutory bodies, including the Governing Council, Standing Committees, Committees on the Human Rights of Parliamentarians and on Middle East Questions, as well as the Forum of Women Parliamentarians and the Forum of Young MPs, will convene at the event. A number of pre-assembly events were held on Friday in the presence of His Excellency the Speaker of the Advisory Council Ahmed bin Abdullah bin Zaid Al Mahmoud along with other dignitaries. At one of the coordination meetings of the Arab Parliamentary Group of the 140th General Assembly of the Inter-Parliamentary Union (IPU), it was decided to include an emergency item to the agenda of the General Assembly of the IPU. The Arab parliamentarians unanimously agreed on a proposal entitled 'protecting the Palestinian people and rejecting to recognize Israeli sovereignty over the occupied Golan Heights and promoting the values of coexistence between religions and peoples,’ reported The Peninsula. 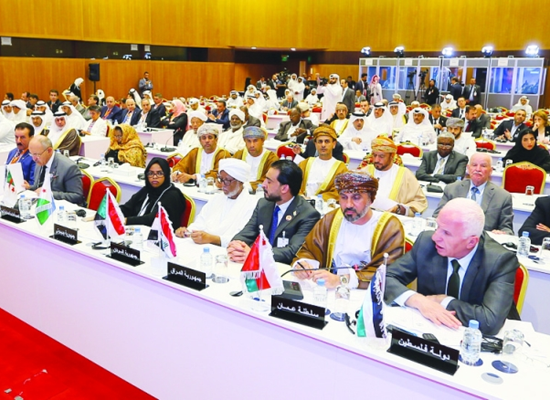 Extending a warm welcome to the Arab Group of the IPU, HE the Advisory Council Speaker said he hoped that participants in the IPU meetings would learn about Qatar's legacy and its people's generosity, reported Qatar Tribune. The participants can witness the comprehensive renaissance in all fields in Qatar, he said, adding that that they can consider Qatar not their second home, but their first, and that the assembly is one for all Arabs. HE Al Mahmoud held separate meetings with the Speaker of Bangladesh's Jatiya Sangsad (parliament), Shirin Sharmin Chaudhury, President of the Latin American Parliament Elias Castillo and President of the Parliament of Albania Gramoz Ruci. Officials from 160 countries have gathered for this event, which is said to have witnessed the largest participation of delegates in the history of its meetings outside the organization’s headquarters in Geneva, Switzerland. The 140th IPU Assembly will conclude on April 10.